Below you will find a few photographs taken by Andean field coordinator, Ricardo Segovia, when E-Tech joined a recent multi-sectoral inspection and soil monitoring of Pluspetrol/Occidental sites in Block 8 of Loreto, Peru, along the Maranon River. 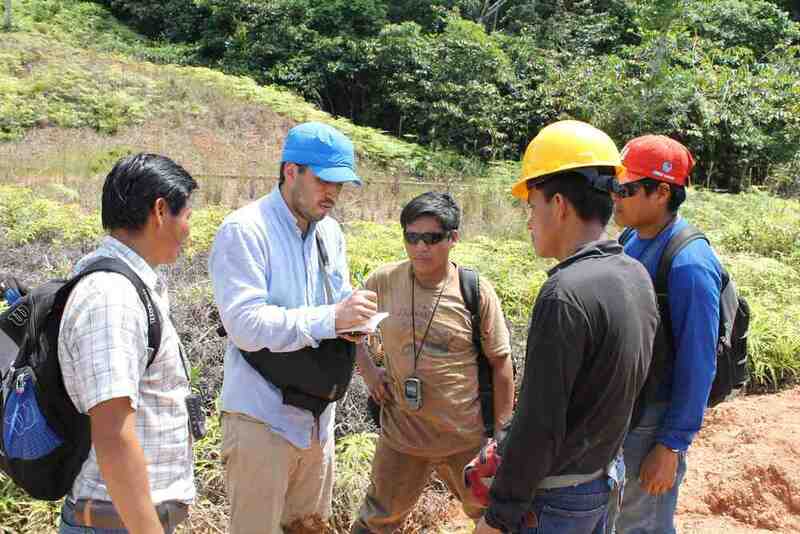 E-Tech, indigenous federations (Achuar-Feconaco-Fediquep), and national government representatives jointly inspected, shared notes, and observed contamination from oil production in the area of the Reserva Protegida Nacional Pacaya Samiria. 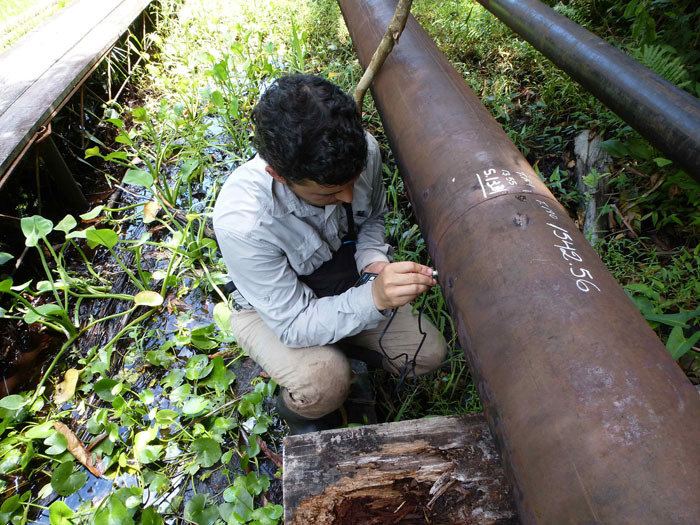 E-Tech is sharing information with national regulatory agencies and producing a report that will examine potential options for remediating an area where Pluspetrol estimates that 90% of its pipelines are submerged and are releasing oil into surface water near the Maranon River, a major tributary of the Amazon River. This tour required walking for 17 kilometers on 10-inch pipes. Hydrogeologist Ricardo Segovia led the E-Tech effort. This trip was supported by the MacArthur and Swift foundations. The next planned field work will be completed for federations in three watersheds. A second E-Tech visit is planned for federations in Block 8. Photo, L to R: 1) E-Tech rented an expensive but critical tool that measures pipe thickness (Ricardo uses it here). Ricardo (2nd from left) and Apu colleagues eating lunch and discussing issues. 3) Note what 10-inch pipe looks like as monitors sway above the water in a rare non-submerged section. 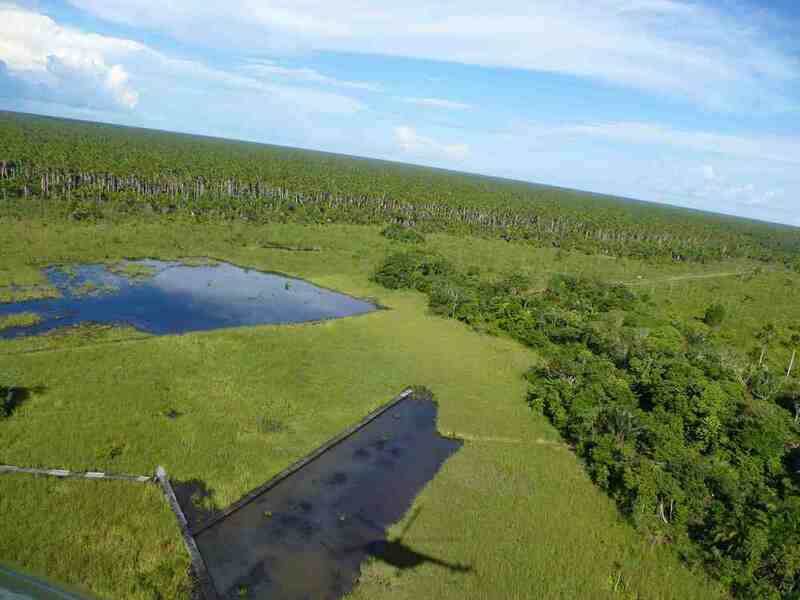 4) Aerial view of the areas along the Maranon River. 5) Crude oil pollution of water and birds. 5) Ricardo in one of the villages.